They call it “Iota”. It folds in after use, and its creators claim it uses 50% less water than your run-of-the-mill stationary toilet. The Iota Toilet works by utilizing a movable bowl. When the bowl is in the down position, it can be used as usual. When finished, the entire bowl is lifted up toward the wall. In doing so, the user connects the pipes in the bowl and a powerful burst of water is released to flush the waste away. Apart from saving water, it is also much smaller than a regular bowl so that it can fit into tiny bathrooms. It also has a rimless design that makes it easier to clean. The Iota toilet takes up a third of the space of a standard toilet when it is folded in the upright position and not being used. 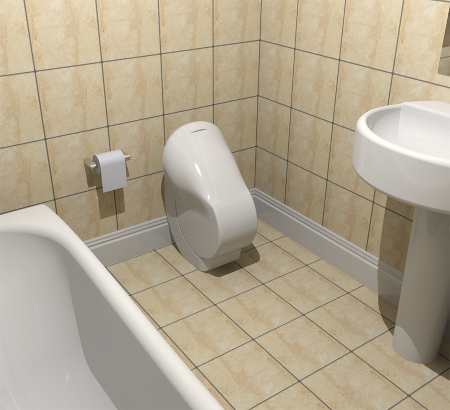 Humphreys and Whiteley also claim the toilet can reduce water use by 50 percent, with the moveable bowl initiating a 2.5-litre flush, compared to six litres for an average toilet. The concept works based on a U-bend in the bowl that disconnects from the waste pipe when in the seated position. Folding the toilet upright activates the flush mechanism, which in turn re-engages the U-bend and waste pipe and creates an air-tight seal that ensures the waste stays where it should be. An internal frame supports the bowl using a sliding hinge mechanism and a nylon roller. The hinge mechanism keeps the toilet straight while the roller takes the weight of the user and transfers it through the frame to the floor. The Iota is currently still in concept stage, but the innovative design duo have already taken steps towards selling their idea.